All HAL Star Parties are held in locations which are smoke free by law. Help us protect our ability to use these sites by not smoking. Thanks. The Howard Astronomical League holds regularly scheduled public and members-only star parties at Alpha Ridge Park from March through November dusk to ~11PM. Impromptu members-only viewing sessions can occur at any time and are communicated via a members-only impromptu email group. These impromptu events are sometimes held at Alpha Ridge Park and at other times held at Carrs Mill Park. Occasionally, impromptu members-only star parties are held at both locations on the same night due to keyholders preferences. The location(s) of impromptu star parties is communicated via email. A key is needed to open the gate at either site. For Alpha Ridge Park only, all HAL keyholders also have a key to ensure that the restroom is unlocked during ALL HAL events. NOTE: Clicking on the Map links for either site now does more than just showing a map of the Park area. It also allows you to enter your starting address and then print out custom turn-by-turn directions. This location is the home of HAL's new "Howard Astronomical League Observatory" at Alpha Ridge Park (HALO). Public and Member's Only star parties, occasional special events, plus member's-only impromptu star parties are held at Alpha Ridge Park at sundown. The date for regularly scheduled star parties changes monthly to coincide with the best lunar viewing so please check the HALcalendar for the next date. 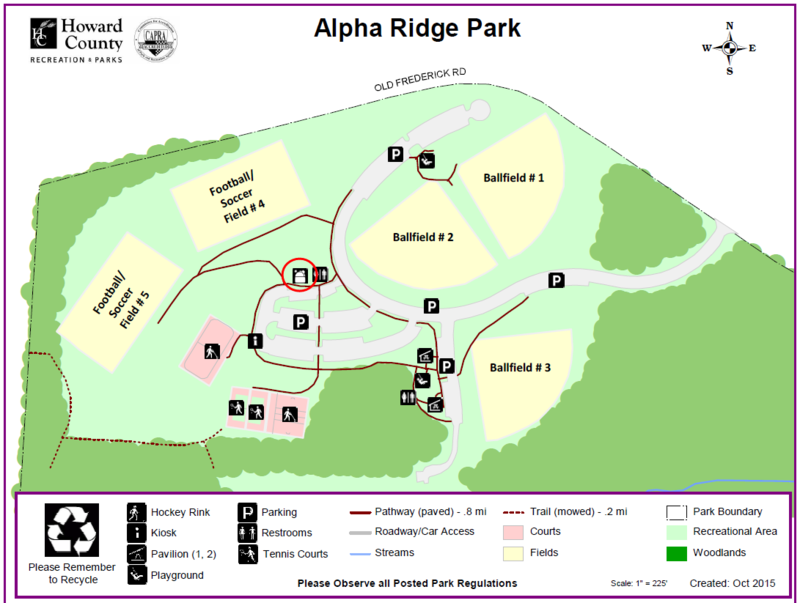 Alpha Ridge Park has recently expanded facilities with more paved parking areas, upgraded lighting, and restroom facilities. Warning: there are steel posts in the parking area that can't be seen unless your headlights are on. Both public and scheduled member's only events are posted on the public "Howardastro" Yahoogroup. Whether the event is open to the public or to member's only is communicated on that Yahoogroup. We ask non-members to respect the member's-only events. During public events HAL members are often busy all evening allowing guests to use their equipment. The member's-only events allow HAL members the "quiet time" needed for private observing. Impromptu star parties at Alpha Ridge Park are communicated via an optional member's-only email list. The HAL observatory is NOT open during impromptu events as a rule. Also, HALO is not guaranteed to be open to members during regularly scheduled members-only star parties. The observatory is ALWAYS OPEN during public events. Iridium Flares, Satellites, etc. visible at Alpha Ridge Park. This site, located atop a former Howard County Landfill, is used solely for Member's Only Impromptu star parties. These events are communicated on a Member's Only Opt-in e-mail list. This is a small location and there just isn't enough room for non-HAL members. The entrance to Carrs Mill Park is not well marked. We have included some photos of Carrs Mill Park, including the entrance, that will help you locate it if you are coming out for the first time.